Occurrence: Oysters are eaten either raw or cooked. They can be used as ingredients in soups and sauces, such as Chinese oyster sauce. Allergy to shellfish such as oyster is less well known than allergy to crustaceans. As with most food allergies, symptoms are usually mild such as oral allergy syndrome, but severe symptoms such as anaphylactic shock can also occur after consumption. Note that oysters are not currently listed in annex IIIa of the EU directive on labelling of foods and thus individuals allergic to molluscs must be alert to the possibility of oyster or other molluscs as hidden allergens. Since oysters are bivalve molluscs, allergy to oyster is most commonly associated with allergy to other bivalves such as clams, mussels, and scallops. Reaction is also likely after ingestion of more distantly related molluscs such as limpet, snails, winkles and whelks (gastropods) or cuttlefish, octopus and squid (cephalopods). Thus, after a diagnosis of allergy to one mollusc, patients are normally advised to avoid all molluscs. Whilst most individuals with allergy to shrimps (crustacea) can tolerate molluscs, individuals with allergy to both types of shellfish have been reported. However, individuals allergic to finfish (such as cod or salmon) do not generally have allergies to shellfish. Molluscs1 include many of the most important seafoods such as abalone, clams, mussels, octopus, oysters, squid, and scallops as well as terrestrial snails. Marine molluscs and crustacea (shrimps, prawns, crabs, crayfish and lobsters) are both known as shellfish. There is a sharp legal distinction because annex IIIa of the new EU labelling directive makes the listing of crustaceans and crustacean products on labels mandatory but does not currently specify labelling molluscs. There is a clear biological difference between molluscs and crustacea but some limited cross-reactivity has been reported. Thus shrimp allergic individuals are more likely to react to molluscs than to an unrelated allergen such as a plant food. To a zoologist, molluscs are a "phylum" on the same level as other phyla such as chordates (including sharks, bony fish and mammals) or arthropods (including insects, mites and crustacea). The most important divisions of the phylum mollusca are the classes bivalvia (bivalves such as clams, mussels, oysters, and scallops), cephalopoda (cephalopods such as cuttlefish, octopus and squid) and gastropoda (gastropods such as abalone, limpets, snails, winkles and whelks). However, members of other classes of molluscs such as chitons are also sometimes eaten although allergy to these has yet to be reported. Molluscs are eaten all over the world but the species eaten and the quantity consumed differs greatly from region to region. In many countries molluscs are eaten occasionally rather than as part of the staple diet. Southern Europe, especially Spain, consumes more cephalopods as calamari and shellfish such as mussels than Northern Europe. The coastal regions of Asia are also major areas of mollusc consumption which are often included in Chinese dim sum, soup and rice porridge, making molluscs important hidden allergens in those dishes. More squid is consumed than any other seafood in Japan. Terrestrial snails are mostly eaten in France, Italy, Spain and Portugal. Adverse reactions following the ingestion of molluscs are similar to those reported for allergic reactions to other foods. They range from mild oral allergy syndrome (itching of the lips, mouth, or pharynx, and swelling of the lips, tongue, throat, and palate), through urticaria (hives), which is probably the most commonly reported symptom, to life-threatening systemic anaphylaxis (difficulty breathing, drop in blood pressure, and even death). Symptoms may involve the skin (itching, swelling), the gastro-intestinal tract (nausea and diarrhoea) and also respiratory symptoms (asthma, rhinitis). Most reported symptoms occurred within 90 minutes of ingesting the food. However, delayed reactions have been reported. The symptoms reported following the ingestion of molluscs may be unusual in two ways. Firstly, there may be a larger fraction of serious reactions than for most foods. Thus molluscs caused 5.6% and 11.7% of serious reactions in France in 2002 and 2003 and an article reported that 36% of cases of anaphylaxis at a clinic in Singapore were due to molluscs. A possible explanation could be that reactions might be attributed initially to bacterial contamination rather than food allergy so that consumption is continued. Secondly, allergic reactions to snails very frequently involve asthma. This may be associated with allergy to dust mites which is involved in many cases of asthma and also in allergic reactions to snails. Symptoms generally occur after ingestion. However, symptoms have been reported on handling or inhaling steam from cooking molluscs and asthma has been associated with workers opening mussels. These reactions have been less frequently reported and less studied than similar occupational allergy to crustacea. Severe symptoms sometimes only occur when exercise follows shortly after eating molluscs (abalone or snails) as has also been reported for several other foods. Studies based of questionnaires in the USA suggest that allergy to molluscs is less frequent than allergy to crustacea by a factor of approximately 3 but that a significant number of individuals suffer adverse reactions (>50 reacting to clam from 14,948 individuals). The frequency of food allergy probably follows the regional pattern of consumption, so that allergy to molluscs may be proportionally more important in France, Spain, Hong Kong or Singapore and less frequent in the United Kingdom or Germany. Food allergies to molluscs have been reported in both children and adults and little is known about the persistence of allergy to molluscs. Our information on cross reactions is imperfect because oral challenge with molluscs has rarely been reported. Thus cross-reactions are identified from clinical histories, skin tests and tests for specific IgE from sera. In general for most food allergens negative skin prick tests predict the absence of allergy except for some food containing unstable allergens. However, some patients with positive skin tests do not react to oral challenges. Tests for specific IgE from sera produce both false positives and false negatives, especially if the patient is allergic to a biologically related organism such as, for example, the legumes peanut and soybean where it is found that many peanut allergic patients show IgE binding to soybean without clinical symptoms on eating soybean2. Cross-reactions are found between molluscs especially within the same class (bivalves, cephalopods or gastropods). For example, in a group of patients with a history suggesting shellfish allergy, patients with a positive skin test to clam had a 0.55 (55%) probability that they have a positive skin test to scallop, whereas those with a negative result with clam had only a 0.05 (5%) probability of a positive skin test to scallop. The same study found that those testing positive to abalone had only a 25% probability of a positive skin test to scallop but a 79% probability of a positive skin test to limpet. Thus those allergic to bivalves (clams, mussels, oysters, and scallops) are likely to react to other bivalves while those reacting to gastropods (abalone, limpets, snails, winkles and whelks) are likely to react to other gastropods. One case of fatal anaphylaxis on consumption of terrestrial snails has been reported of a patient who had been diagnosed as allergic to abalone showing that the cross reactions relate to biological families (gastropods) rather than to sea food versus land animals. However, cross-reactions between the classes of molluscs are also quite common. There is good evidence for cross reactions between molluscs and arthropods (the phylum contains insects, mites and crustacea) and two different cross-reactivities are reported. Allergy to crustacea (shrimps, lobster, crawfish, or crab) is generally due to allergy to a highly conserved muscle protein called tropomyosin. In vitro studies show that IgE antibodies (the class involved in allergy) from shrimp allergic patients also frequently bind to tropomyosins from molluscs. However, as noted above, this does not necessarily demonstrate clinical allergy. An alternative estimate come from the observation that a positive skin test with shrimp was associated with a 26%-41% probability of a positive skin test to scallop, clam, oyster, abalone or limpet. Tropomyosin is also involved in cross-reactions between insects and crustacea and it is possible that individuals with allergy to cockroaches and other arthropods might show cross-reactions with molluscs. The second well established cross-reaction is between dust mites and gastropods such as snails and limpets. This does not seem to depend on tropomyosin as only 2/28 patients in one study showed IgE binding to tropomyosin. In this case, the cross-reaction has been confirmed by oral challenges. For example, out of 51 children with dust mite allergy, 36 showed positive skin prick tests with snail. 15 of the children who had shown a positive skin test were challenged with cooked snails and 11 reacted. This suggests that as many as 30-40% of dust mite allergic individuals might react to snails although other studies have suggested that only approximately 15% might react. Allergy to limpet has also been associated with dust mite allergy. The reactions reported or observed were also unusual in that asthma was the most frequently reaction. Thus if you are dust mite allergic, have not recently eaten snails or related shellfish but intend to try them in future, it may be prudent to undergo a skin prick test to the relevant molluscs. The effects of desensitation therapy to dust mites on the probability and severity of reactions to molluscs has provoked controversy. This may be a topic to raise with your doctor if you are considering such therapy. No cross-reactions have been reported between molluscs and foods from fin fish, birds or mammals. Allergies to molluscs are diagnosed using the same procedures as for other food allergies. A detailed patient history is first taken. Skin and laboratory tests are then used to identify the foods likely to cause allergic reactions, which can then be eliminated from the diet. Commercially available extracts from molluscs include abalone (Haliotis spp. ), blue mussel (Mytilus edulis), clam (Ruditapes spp. ), octopus (Octopus vulgaris), oyster (Ostrea edulis), pacific squid (Todarodes pacificus), scallop (Pecten spp. ), snail (Helix aspersa) and squid (Loligo spp.). There are some pitfalls in investigating allergy to molluscs as the identification of the species eaten may not be simple, especially if a restaurant has substituted a cheaper mollusc such as limpet for an expensive one such as abalone. Skin prick testing appears to identify almost all cases of food allergy with some false positives. Skin prick test using fresh food often improves the identification of the suspected food. In vitro tests on sera are also helpful but there is insufficient data to assign probabilities of reaction to levels of specific IgE. Oral challenges have rarely been made with molluscs and the lowest threshold dosages remain to be elucidated. Avoidance is the only therapy after diagnosis of an allergy to any mollusc. Because of the high probability of cross-reaction, it is probably sensible to eliminate from the diet all molluscs unless a negative skin test suggests that a species may be safely consumed. Even in that case, the difficulty of identifying molluscs after cooking suggests that care should be taken. Care should also be taken to avoid molluscs as ingredients in soups and dishes such as dim sum. Fortunately, there are no nutritional consequences to eliminating molluscs from the diet and no substitutes are required. 1. "Mollusk" may be the preferred American spelling, and "mollusc" the British spelling but both date to the 1830s as translations of "mollusque" from Cuvier and both are used by American and British writers. 2. It is believed that only high affinity IgE binding causes symptoms and that anti-peanut IgE binds weakly to related soybean proteins (the affinity is not measured by the standard tests). The Pacific oyster, Crassostrea gigas, NEWT 29159, is the oyster consumed most world wide. It has been used in most studies of oyster allergens and cross-reactivity. Two other oysters have been used in studies of food allergy. The eastern oyster, Crassostrea virginica, NEWT 6565 is closely related to the Pacific oyster and the partial amino acid sequence of its tropomyosin is identical to that from Crassostrea gigas. The native oyster or edible oyster, Ostrea edulis, NEWT 37623 is used to prepare the oyster extract, Rf290, for the Pharmacia CAP system. Leung & Chu (2001)  reported that all 15 subjects whose sera was used in their study had clinical histories of at least two or more symptoms, including pruritus, urticaria, angiodema and gastrointestinal disorders, within 1 hour after ingestion of oysters. Lehrer & McCants (1987)  reported two groups of patients with sensitivity to oysters: 6 adults who reported sensitivity to oysters only and 7 adults who reported sensitivity to both oysters and crustaceans. All the symptoms of the first group were gasterointestinal including nausea, vomiting, diarrhoea and abdominal cramps. 5/7 with sensitivity to oysters and crustacea reported gasterointestinal symptoms (4/5 only reported gasterointestinal symptoms) and 2 reported wheezing and shortness of breath (one of these also reported urticaria and angioedema). Wu & Williams (2004)  used commercial extracts of shrimp (Penaeus sp. ), crab (Callinectes sapidus), lobster (Homarus americanus), clam (Mercenaria mercenaria), scallop (Pecten magellanicus), oyster (Crassostrea virginica) and made extracts of abalone and limpet in house. Wu & Williams (2004)  defined a positive SPT as 3 mm greater than the negative control. Wu & Williams (2004)  tested 84 patients who reported shellfish allergy. Wu & Williams (2004)  aimed to use SPT to diagnose to which shellfish their patients were allergic. They reported that 70 patients gave positive SPTs to a shellfish and that 25/70 patients were sensitised (i.e. SPT positive) to crustacea alone, 27/70 were sensitised to both crustaceans and molluscs and 18/70 were sensitised to molluscs alone. Sensitisation to oyster was more frequent than to clam or scallop with 15/70 but less frequent than to abalone, limpet or crustacea. A positive SPT to to clam or scallop predicted a positive SPTs to oyster with 0.56 and 0.46 probablitity while a negative SPT gave 0.16-0.17 probability of a positive SPT to oyster. Similarly, an oyster positive SPTs predicted a 0.33 probability of a positive SPT to scallop or clam and a negative oyster SPT gave 0.07 and 0.11 probability of reaction to scallop or clam. By contrast, there was a much smaller difference in the probability of a skin test reaction with gastropods and crustacea with positive and negatives test results to oyster. Leung & Chu (2001)  extracted freshly killed Pacific oyster, Crassostrea gigas. Whole oyster was homogenized in PBS, pH 7.2 with a polytron, mixed for 8 h in PBS containing PMSF (100 µg/mL) and aprotinin (1 µg/mL) (Roche Molecular Biochemicals, Indianapolis, IN, USA). The lysate was then centrifuged for 20 min at 10000 x g at 4°C. Leung et al. (1996)  took approximately 2 gm of muscle protein from several species of molluscs and crustacea which was boiled in deionized distilled water for 10 minutes. The boiled muscle was homogenized with lysis buffer (100 mM Tris, 10 mM EDTA, 10 mM 2-mercaptoethanol) or phosphate-buffered saline (PBS) in a Polytron homogenizer (Brinkman) for 30 seconds and centrifuged at 14,000 rpm for 10 minutes. The supernatant was aliquoted and stored in -70° C.
Lehrer & McCants (1987)  boiled oyster, Crassostrea virginica, in deionized water for 15 minutes. Extracts of raw and boiled oyster (extracts of crustacea were made from meat with PBS in a waring blender for 3 minutes followed by overnight at 4°C on a skaker), the cooking water from boiled oyster and the shell fluid from raw oyster, were dialyzed against deionized water and centrifuged at 80000 x g. The supernatants were lyophilized and stored desciccated at -20°C. Leung & Chu (2001)  and Leung et al. (1996)  used immunoblotting. Lehrer & McCants (1987)  used RAST. Leung & Chu (2001)  used sera from 15 subjects with a clinical histories of reaction to oyster and sera from 10 controls. Leung et al. (1996)  used 9 sera, which had been previously shown to react to recombinant shrimp tropomyosin. Lehrer & McCants (1987)  tested sera from 3 groups of patients: 6 adults who reported sensitivity to oysters only, 7 adults who reported sensitivity to both oysters and crustaceans, and 12 subjects who reported either tolerance of oysters or lack of exposure but were sensitive to crustacea. Summary of Results:Lehrer & McCants (1987)  reported that sera from only one of the 6 adults who reported sensitivity to oysters only gave a significant RAST (ratio 6) with any oyster extract. This was with raw oyster. 3/7 sera from patients sensitive to oysters and crustacea showed elevated IgE binding (ratio 7 to 41) to both raw and boiled oyster. 6/12 sera from crustacea sensitive individuals also bound raw and boiled oyster with RAST ratios of 6 to 34. The correlation coefficient of RASTs between crab and oyster was 0.89 over the sera from crustacea sensitive individuals (and 0.84, 0.82 and 0.69 for crawfish, lobster and shrimp). Crustacean extracts were also effective inhibitors of oyster RASTs. They concluded that common allergens were involved. Leung et al. (1996)  loaded 100 to 150 µg of muscle extract for 1D-SDS-PAGE onto a 10% acrylamide separating gel with a 5% stacking gel. Samples were denatured by boiliing in 2X sample loading buffer (0.125 mol/L Tris, pH 6.8, 4% SDS, 10 mM 2-mercaptoethanol, and 0.002% bromophenol blue) for 10 minutes. Leung & Chu (2001)  similarly used 10% acrylamide separating gels. Immunoblotting detection method:Leung et al. (1996)  transferred proteins onto a nitrocellulose filter in a semi-dry transfer cell (Bio-Rad) at 15 V for 1 hour (checking by staining with Ponceau S). 3 mm strips were blocked with 3% (w/v) nonfat dried milk in PBS for 30 minutes. The strips were incubated in the test serum (1:10 dilution) in PBS with 3% milk at 4° C overnight with shaking, then washed in PBS-Tween (0.05% Tween-20 in PBS) at room temperature three times for 20 minutes each. The bound IgE on the strip was detected by incubation with 0.4 µCi/ml of iodine 125–labeled anti-human IgE (Sanofi-Pasteur Diagnostics, Ohaska, Minn.) in PBS buffer with 3% milk at 4° C overnight revealed by exposed to x-ray film with an intensifying screen from 24 hours to 1 week at -70° C.
Leung et al. (1996)  reported that IgE from 9/9 sera from shrimp allergic subjects bound to a 38 kDa band, 2/9 bound to a 49 kDa band and 1/9 to a 69 kDa band with extract from oyster (Crassostrea gigas). Leung & Chu (2001)  reported that recombinant Cra g 1.03 was able to inhibit IgE reactivity against itself, at 59 kDa, as well as a 38-kDa band of the oyster extract on the immunoblot. Absorption of sera from oyster allergy subjects with recombinant shrimp Met e 1, lobster Pan s 1 or crab Cha f 1 was able to remove most but not all of the IgE reactivity to either recombinant Cra g 1.03 or to oyster extract. Lehrer & McCants (1987)  reported IgE cross-reactivity between crustaceans (white shrimp, blue crab, spiny lobster and crayfish) and eastern oyster, Crassostrea virginica. IgE binding by oyster extract was detected both using sera from patients who were only clinically sensitive to crustacea and also with sera from patients who were sensitive to both oysters and crustacea. 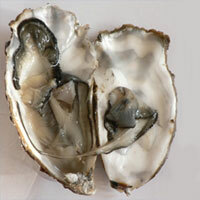 The Pharmacia oyster allergen f290 is from Ostrea edulis. Chu KH, Tang CY, Wu A, Leung PS. Seafood allergy: lessons from clinical symptoms, immunological mechanisms and molecular biology. Ishikawa M; Shimakura K; Nagashima Y; Shiomi K.
Ishikawa M; Ishida M; Shimakura K; Nagashima Y; Shiomi K.
cDNA cloning and molecular identification of the major oyster allergen from the Pacific oyster Crassostrea gigas. Reactivity of IgE antibodies with crustacea and oyster allergens: evidence for common antigenic structures. Leung PS, Chow WK, Duffey S, Kwan HS, Gershwin ME, Chu KH. IgE reactivity against a cross-reactive allergen in crustacea and mollusca: evidence for tropomyosin as the common allergen. Clinical characteristics and pattern of skin test reactivities in shellfish allergy patients in Hong Kong. Alternatve Allergen Names:Cra g 1, Cra g 2 and Cra g 1.03 (names not in IUIS list). Oligomeric Masses:Tropomyosins form dimers. Ishikawa et al. (1997)  report a mass of 86 kDa for the oyster allergens by gel filtration. Allergen epitopes:Ishikawa et al (1998)  digested purified Cra g 1 with lysylendopeptidase, losing about 30% of the IgE binding activity, and separated the peptides. The strongest IgE binding peptide was further digested with trypsin and the sequence IQLLEEDMERSEER corresponding to 92-105 by alignment with shrimp sequences (41-54 of Q95WY0) was found to be the main epitope. This was different from the epitopes identified by Shanti et al. (1993)  from shrimp, Pen i 1, (residues 153-160 and 50-66) and also from the epitope near residues 265-268 identified from horned turban, Turbo cornutus, by Ishikawa et al (1999) . However, Ayuso et al. (2002)  subsequently identified 85-105 as one of 5 IgE-binding regions of Pen a 1, the tropomyosin from Farfantepenaeus aztecus. Process, chemical, enzymatic:The allergenicity of tropomyosins can survive cooking, possibly because tropomyosin have a very simple helical structure which can rapidly refold after denaturation. The preparation of extracts often includes heating in a boiling water bath as in Ishikawa et al. (1999) . Leung et al (1996)  demonstrated cross-reactivity between tropomyosins from arthropods (crustacea and insects), tropomyosins from gastropods: abalone (Haliotis diveriscolor) and whelk (Hemifusus ternatana), bivalves: mussel (Perna viridis), pen shell (Pinna atropupurea), scallop, oyster (Crassostrea gigas) and clam (Lutraria philipinarum) and cephalopods: cuttlefish (Sepia madokai), squid (Loligo edulis) and octopus ((Octopus luteus). Ishikawa et al. (1999)  demonstrated cross-reactivity between purified tropomyosin allergens from the Pacific oyster, Crassostrea gigas, Cra g 1, and from horned turban, Turbo cornutus, by ELISA inhibition. Also binding to Cra g 1 was inhibited by extracts of scallop (Patinopecten yessoensis), clam (Tapes japonica), horned turban (Turbo cornutus) or whelk (Neptunea arthritica). Tropomyosins bind to actin in muscle increasing thin filament stability and rigidity. Depolymerization from the pointed end is inhibited, without affecting elongation (Broschat, 1990 ). As tropomyosin prevents the binding of myosin, it may play an important role with troponin in controlling muscle contraction. The sequence exhibits a prominent seven-residues periodicity and this is reflected in the interactions of the 2 polypeptide chains which form a coiled coil structure of two alpha-helices as originally proposed by Crick in 1952 (see the porcine structure 1C1G). Some tropomyosins are N-acetylated modifying the structure of the N terminal region and increasing the affinity for the thin filaments (Greenfield & Fowler, 2002 ). Ishikawa et al. (1997)  reported that the oyster allergens were 86 kDa glycoproteins with a carbohydrate content of about 5%, composed of 35 kDa subunits. They were remarkably abundant in Glx, followed by Asx, Ala, and Leu, and were devoid of Pro and Trp. Their reactivities against the sera from seafood allergy patients were equivalent. The molecular masses and characteristics of amino acid composition strongly suggested that the allergens were tropomyosins of C. gigas. Ishikawa et al. (1997)  report purification of two allergens, which they named as Cra g 1 and 2, from the oyster Crassostrea gigas by gel permeation chromatography on a Sephacryl S-300, ion-exchange FPLC on a Mono Q HR 5/5, and reverse-phase HPLC on a TSKgel Phenyl SPW-RP. Although the allergens were separated from each other by ion-exchange FPLC, they showed the same behaviors in gel permeation chromatography and reverse-phase HPLC. Leung & Chu (2001)  expressed a recombinant allergen, Cra g 1.03, as a GST-fusion protein. A 500-mL overnight culture of a pGEX expressing clone of the Cra g 1.03 cDNA was induced with 1 mm IPTG and the cells were harvested. After which, the cells were suspended in 5 mL of lysis buffer (1% Triton X-100, 1% Tween 20, 10 mm dithiothreitol) and sonicated. The cell lysate was then centrifuged to pellet the debris and the supernatant was added to glutathione agarose (Sigma, St Louis, MO, USA). After incubating for 2 hours on a rocker, the glutathione agarose was washed 3 times with PBST (PBS containing 1% Triton X-100, pH 7.3) and the bound protein eluted with 2 mL of 5 mM reduced glutathione in 50 mM Tris-HCl, pH 8.0. This gave a 59 kDa band on SDS-PAGE and bound IgE from 12/15 oyster allergic sera. The partial sequence of tropomyosin from Crassostrea virginica O77246 is 100% identical to that from Crassostrea gigas over 160 residues. The partial sequence of 114 residues of the tropomyosin from Crassostrea rhizophorae Q6T257 is signifantly different from these with 84% identity over only 53 residues of the sequence. It has an extra 51 N-termal residues which align with tropomyosins from other molluscs. Ishikawa et al (1998)  and Ishikawa et al (1999)  reported the sequences of peptides giving 205 residues of the sequence from Crassostrea gigas tropomyosin, including most of the missing N-terminal sequence. Ayuso R, Lehrer SB, Reese G.
Identification of continuous, allergenic regions of the major shrimp allergen Pen a 1 (tropomyosin). Shanti KN, Martin BM, Nagpal S, Metcalfe DD, Subba Rao PV. Identification of tropomyosin as the major shrimp allergen and characterization of its IgE-binding epitopes. Tropomyosin prevents depolymerization of actin filaments from the pointed end. Tropomyosin requires an intact N-terminal coiled coil to interact with tropomodulin.